Orthodox Rabbi Gerald Meister, a leader in Jewish-Christian relations, challenged Jewish leadership on their ineffectiveness in confronting the Jew-hatred in Muslim culture and politics, which underlies anti-Zionism. (JooTube recorded this interview with Rabbi Meister in Nashville, February, 2012. He passed away erev Pesach, 2013). 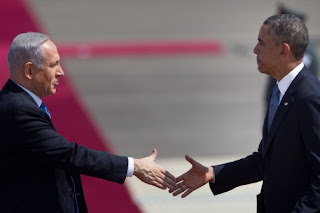 "This Passover, Free Us From A Failed Jewish Leadership" Stella Paul in American Thinker, April 23, 2011. This week is Passover, the season of deliverance, and I'm praying for deliverance from America's failed Jewish leadership. As Jews confront the most dangerous era since World War II, whom are we stuck with for leaders? A clueless bunch of mini-Pharaohs, strutting around proclaiming their moral superiority, blissfully unaware the Jewish people's mortal enemies are pulling down their pants and laughing at them. Cataloguing their collective acts of evasion, cowardice, appeasement, and surrender is not for the faint of heart, but, luckily, I'm fortified by matzo balls and ready to rock. At the Passover Seder, Jews recite Dayenu, a prayer listing the many blessings bestowed by the Almighty, each of which would have sufficed (Dayenu) in its own right. Here, alas, is a woeful Dayenu of the failures of the American Jewish establishment. Can anyone tell me why these preening big shots haven't been forced to resign in shame? Why, in God's name, are our purported "leaders" still collecting cushy paychecks when their credibility is bankrupt? If they only had allowed a storm of anti-Semitism to rise in the West, and hate crimes against American Jews to skyrocket to unprecedented heights, while they declined to muster even a listless response -- Dayenu -- they would have failed. If they only had stood aside, shrugging, while America's college campuses became battlegrounds in the war against Israel, where anti-Semitic lies were force-fed to America's next generation of leaders, and Jewish students were intimidated and taught self-hatred and alienation from their own identities -- Dayenu -- they would have failed. If they only had refused to educate the Jewish people about the growing threat from radical Islam, and remained silent about the long, tragic history of Jews forced to live as oppressed dhimmis under Muslim rule, as mandated by Koranic law -- Dayenu -- they would have failed. "The fight against terrorism is global... and allows for no easing off, no weakness and no negligence," Hollande told a crowd of around 1,500 people that had gathered in the southwestern city of Toulouse for the service, AFP reported. A self-described Al-Qaeda sympathizer, 23-year-old Merah murdered Rabbi Jonathan Sandler, his sons Aryeh and Gavriel and Miriam Monsonego at the Otzar HaTorah school in Toulouse. Before that, he murdered three Muslim paratroopers of North African heritage. Merah was ultimately killed when he tried to flee a raid on his apartment. Merah, a French citizen with Algerian roots and who in 2011 received military training in Pakistan, said he wanted to avenge the deaths of Palestinian Authority Arab children and punish France for sending troops to Afghanistan. French police doubt that Merah could have acted alone, but the only person charged with helping him so far is his brother Abdelkader who has denied the charges, AFP reported. Last month, however, police arrested two men in connection with Merah's killing spree, and in early December a 38-year-old man and his girlfriend were arrested on suspicion of links to the attacks but both were later released without charge. 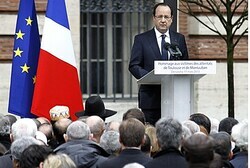 France has seen a surge of 45% in the number of anti-Semitic incidents over the past year, since the Toulouse attacks. Last week President Shimon Peres attended memorial events for the victims of the Otzar HaTorah massacre. He also met with the heads of the Jewish community of France and with a delegation of Imams including the heads of the Egyptian, African, Moroccan and Senegalese communities and heads of central mosques.